There is still significant opportunity for Apple's iPhone business to grow. See the opportunity illustrated in these two charts. One of the biggest criticisms for Apple (NASDAQ:AAPL) stock as a long-term investment is the company's size. With $176 billion in trailing-12-month revenue, some investors worry the company will run out of room for growth -- or, even worse, run out of ways to sustain current levels of sales. While Apple bulls have a wide range or counterarguments, one of the most significant arguments lies in the long-term potential in China for smartphone growth sales. 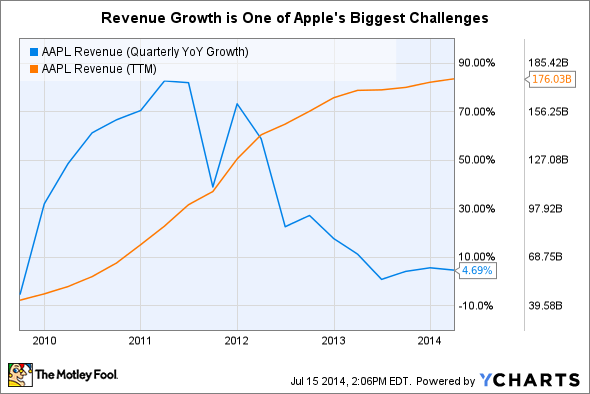 It's important to acknowledge the severity of the challenge Apple does face in continuing to grow its top line. There's little doubt that growth will be slower in the coming years than it was in recent years. Consider this chart. Even a new product category would have to be wildly successful to have a meaningful impact on Apple's business. Consider for instance, if Apple's iWatch hit 14.8 million in unit sales during the first year of availability, matching the first-year success of the iPad. At an average selling price of $350, that would add $4.5 billion to Apple's top line. While that sounds big in absolute terms, it would only boost total revenue by 2.9%. Growing revenue won't be easy. With Apple's iPhone business accounting for 57% of Apple's revenue, it's this segment that could move the needle for Apple. If there are ways this segment can grow, even small growth in iPhone sales could be meaningful for Apple's business. Where can investors find this sort of opportunity for growth of Apple's smartphone business? In the world's largest smartphone market: China. Apple is already a dominant player in this market. 27% of smartphone users in China use a handset that costs $500 plus, and 80% of these are iPhones, according to data from Chinese app analytics company Umeng. Obviously the average China citizen can't afford an iPhone. But the fact that Apple clearly dominates the high-end of the smartphone market in China speaks volumes about the tech-giants powerful clout in the important market. As the country's GDP continues to improve over the longer haul, therefore, it's likely that Apple may see more users want to buy an iPhone as total smartphone penetration grows. The biggest opportunity for Apple in China is likely to come from its new partnership to sell iPhones at the world's largest carrier, China Mobile (NYSE:CHL). The carrier just recently started rolling out its 4G LTE in the country, and the early results of the customer acquisition trajectory is startling. Data for chart retrieved from China Mobile's monthly operating data. The growth in 4G subscribers at China Mobile appears to be exponential. Obviously Apple's data intensive and premium-priced iPhones will be a key beneficiary of China Mobile's expanding LTE network. But the chart above only illustrates the growth of the network. The chart below shows the opportunity for 4G penetration over the longer haul by illustrating what a small percentage 4G subscribers are today of China Mobile's total customer base. While obviously a number of smartphone manufacturers will be vying for China Mobile's growing LTE network, you can bet Apple has its eyes on the market. No wonder Apple launched the iPhone on the carrier's network in conjunction with China Mobile's LTE rollout -- this is a monstrous opportunity. China Mobile plans to continue to rollout the network rapidly. During Apple's first fiscal quarter earnings call, Apple CEO Tim Cook said that China Mobile's 4G network was only in 16 cities, planning to hit 340 cities by year-end. Apple is already benefiting from its partnership with China Mobile. The carrier played a key role in helping Apple grow iPhone sales by 28% in Greater China in Apple's second fiscal quarter, a significantly faster rate than the 17% growth in units sold for the segment overall. China Mobile's growing 4G network, combined with an improving GDP in the country, should provide ample opportunity for Apple's smartphone business over the long haul. Further, growth in this segment should also play a role in helping Apple to continue to grow its overall top line, too.